Is mobile maintenance optional or essential? Guest blog by Julia Scavicchio, formerly of Better Buys. Maintenance is an industry that’s built on making existing technology run the way it’s supposed to—but it’s also one that’s seen significant innovation in recent years. 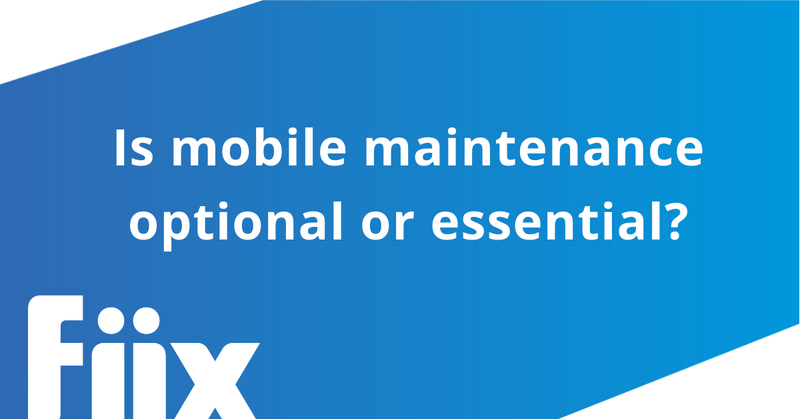 Among the many advancements that have reached the maintenance world of late is the introduction of mobile maintenance. For teams already using an app to complete their day-to-day work, many can’t imagine life without it. But what about those who haven’t yet made the leap? Are the gains to be made from mobile maintenance enough to deem the technology essential, or is it simply a nice-to-have? The real challenge is that many businesses consider their maintenance department a cost center. Often, technicians in such organizations operate under a largely reactive maintenance strategy, meaning costs quickly add up due to emergencies. Investing more into this area could mistakenly be seen as a risk of losing a return on investment (ROI). However, when mobility enters this environment, it can revolutionize essential tasks. Issues concerning stress, poor communication, and constant downtime are the result of a dangerous reactive cycle when technicians don’t have the right tools for the job. Mobile maintenance can drastically change how core job duties are done for the better. When preventive maintenance is scheduled well ahead of time, technicians begin each new work day with clear objectives. This information is easily available from a mobile device, keeping maintenance teams on task as they move around a facility. Technicians can also receive real-time alerts about emergencies or tasks that can’t be scheduled. There will always be a reactionary role for maintenance teams, and mobility helps them rapidly communicate on the go while also offering a platform for proactive scheduling. For operations without mobile access, there’s often a central computer that technicians visit periodically to track work orders. This means they’re between on-site locations and their desk just to track information. The practice also involves paper-based tracking. Technicians often write out details, then manually type them into the system later. With a mobile device, technicians enter all the necessary information at the time it’s collected instead, saving unnecessary paperwork and wasted time. Technicians can also take pictures of receipts and other documents, then digitally attach them to work orders to show how the work was completed. All the information is centralized and easily accessible from any location. Having an inaccurate spare parts inventory can be a nightmare for maintenance teams. If no spare parts are left, vendors must be contacted to ship out replacements, leaving operations at a standstill until delivery. When technicians can continuously update their inventories from the palms of their hands, these situations are easily avoided. If routine maintenance is scheduled ahead of time and the technician sees that spare parts are low, the parts can be ordered immediately. Or, if there’s a sudden failure and the technician uses the last of a spare part, they can quickly order a replacement for next time. Technicians are able to adopt proactive mindsets to prevent an immense amount of stress in the future. Mobile maintenance can help teams to vastly improve their maintenance operations, reducing the downtime and reactive maintenance that often drive costs up. Excessive labor time, unbalanced inventories and poor communication shouldn’t haunt teams that could build better practices if given the right tools. The advancements that are possible with mobile maintenance make the technology essential. Julia was formerly an editor with Better Buys, a trusted source for maintenance software news and research. Follow @Better_Buys for more on how technology is changing our workforce.